It would be great if you included information on color options in reviews of bike accessories. Looking at the Velo Transit website shows me a nice selection of very masculine colors. I’m not overly girly but none of the colors shown goes with my bike. Or ask a woman to use it and write a parallel review. Her comparison may well be to a woman’s purse, which is a different benchmark than just comparing to other panniers. I’d also love to know how the pannier works when you take it off the bike and carry it. 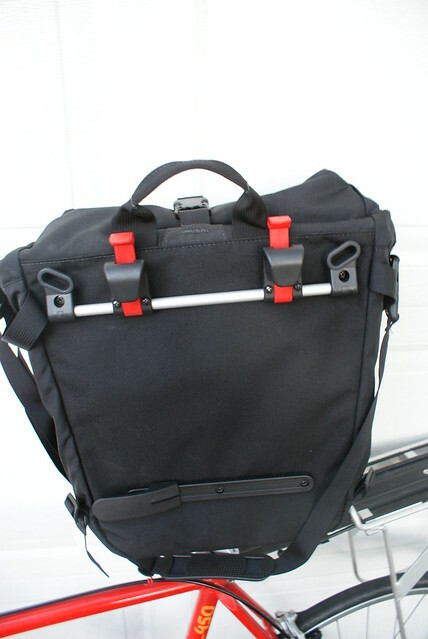 I used to have panniers with this type of hook to fit onto the rack and they were always catching onto my clothing. I’m posting this comment not because it’s a bad review but because manufacturers need to hear this kind of feedback or they’ll never catch on to the market they’re missing or ways to improve the products to fit into everyday living, not just into cycling. I personally don’t think of hi-vis yellow as a “masculine” color – but I understand your point! Your suggestion on colors is good – I don’t tend to care as much so I didn’t think about it. In terms of having a woman review it – we only received 1 pannier to review (and then had to send it back), but Elizabeth is reviewing the female version of the backpack we got from Velo Transit. 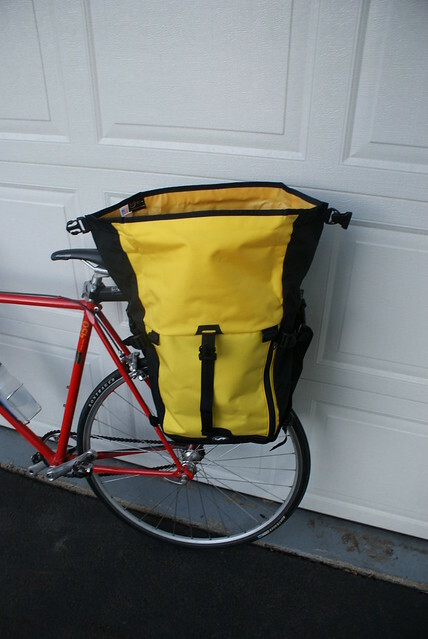 For off the bike – the pannier has a shoulder strap and a handle (you can see both in the second picture). The clips to attach it to the bike make it a little awkward to carry, but it’s not too bad. They don’t tend to hook on clothing.